In the Basque Country (Euskadi in Basque, or País Vasco in Spanish), an autonomous community in northern Spain, the climate is cool and damp on the coast because of the influence of the Atlantic ocean, while in inland areas it becomes colder with increasing altitude, and a little more continental and more arid in the south. Along the coast the wind blows frequently, in fact there are beaches frequented by surfers. Winter on the coast is quite mild, but sometimes cold air masses from the northeast can bring cold periods, when it can even snow, and frosts may occur, typically light. This happens more easily in the eastern part of the coast (see San Sebastián) than in the west (see Bilbao). The rains are quite abundant in the northern part of the Basque Country, where they typically exceed 1,000 millimeters (40 inches) per year; in the central part, instead, they drop below 800 mm (31.5 in), and in the far south, where the landscape is much more arid, even below 500 mm (20 in). Summer is everywhere the least rainy season. 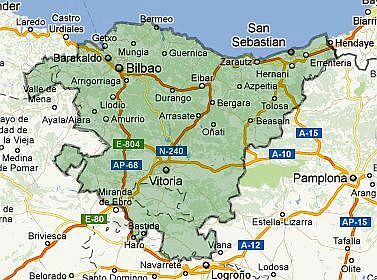 In the interior, we find hills and mountains: the Basque Mountains, which are part of the Cantabrian Mountains, separate the cool and damp part of Spain from the arid plateau (Meseta); the highest point is the massif of Aizkorri, which reaches 1,551 meters (5,089 feet). The wind that comes down from the mountains can cause rapid increases in temperature due to the föhn effect: in these cases, along the coast the temperature can exceed 20 °C (68 °F) in winter, 30 °C (86 °F) in autumn and spring, and 35 °C (95 °F) in summer, when, however, this wind is rare. The coast, overlooking the Bay of Biscay (or Vizcaya) is indented, and characterized by cliffs that plunge into the sea and by caves, though there are also beaches. On average, the amount of sunshine in the Basque Country is never very good, at least in the northern and central part: in July and August there are 6/7 hours of sunshine per day in Bilbao and San Sebastián, and 7/8 in Vitoria; in the other seasons, and especially in late autumn and winter, it is even worse, and the sky is often cloudy. On the contrary, in the south, in the valley of the Ebro, summer is sunny. Here are the average daily sunshine hours in Bilbao. In the west, a short distance from the coast, we find Bilbao: here the monthly average temperature ranges from 9.5 °C (49 °F) in January to 21 °C (70 °F) in August; rainfall amounts to almost 1,200 mm (47 in) per year, with a maximum in November of 145 mm (5.7 in) and a minimum in July of 50 mm (2 in). 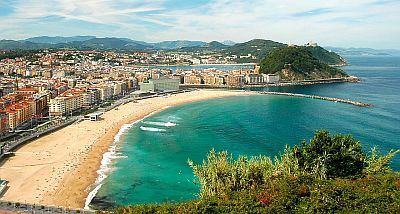 In the eastern part of the coast, we find San Sebastián. Here the average temperature ranges from 8.5 °C (47.5 °F) in January to 19.5 °C (67 °F) in August. Although the winter temperatures are typically mild, as mentioned, this eastern part of the coast is more exposed to cold air outbreaks, and consequently to snow and frost. In January 1985, the temperature dropped to -9 °C (16 °F), and in February 2012 to -5 °C (23 °F). In summer, although the temperatures are generally mild, there may be short heat waves. In August 2003, the temperatures reached 38.6 °C (101.5 °F). Here are the average temperatures of the Igueldo station. The rainfall in San Sebastián amounts to 1,500 mm (60 in) per year: we are in the wettest area of the coast; at the Hondarribia airport, slightly further to the east and at the border with France, it gets to 1,650 mm (65 in). Summer is the least rainy season, but it still rains for 10/11 days per month, and the amount does not drop below 85 mm (3.3 in) in July. In the central part of the Basque Country, in the area called Llanada Alavesa, the weather gets colder in winter and a bit warmer on summer days. 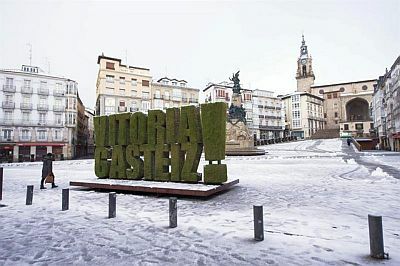 In Vitoria-Gasteiz, the capital, located at 500 meters (1,600 feet) above sea level, winter is cold enough, but above all the city is exposed to invasions of cold air, which can produce snow and frost: on average, 11 days with snowfall per year occur, from November to April. In summer, the average temperatures are similar to those of the coast, although during the day it can get hot with a higher frequency, while nights are definitely cool. Precipitation in Vitoria-Gasteiz amounts to 750 mm (29.5 in) per year; the rainiest month is November with 90 mm (3.5 in), while the least rainy are July, August and September with 40 mm (1.6 in). In the southern part of the Basque Country, in the Ebro Valley (the area called Rioja Alavesa, see Laguardia), the climate gets semi-continental features, similar to those of the Meseta. In fact, it is semi-arid, since annual rainfall drops below 500 mm (20 in) per year; winters are quite cold, with a January average around 6.5 °C (43.5 °F); summers are hot, and there may be some scorching days, while nights remain pretty cool. It is an area renowned for its wine. Here are the average temperatures of Logroño, which is located in the same area, but on the south bank of the Ebro River, in the province of La Rioja. In Logroño, just 435 mm (17 in) of rain fall per year, with a maximum in April and May of 50 mm (2 in) and a minimum in August of 20 mm (0.8 in). Owing to the barrier formed by the aforementioned Basque Mountains, Atlantic currents arrive with difficulty in this area, so Autumn and winter are not very rainy. The sea in the Basque Country is very cool, if not a bit cold, even in summer, in fact the water temperature at its highest, from July to September, is still around 20/21 °C (68/70 °F), as you can see from the sea temperature near Bilbao. The best time to visit the Basque Country, at least the center-north, is the summer, from June to August or the first half of September, in fact it is the driest and sunniest time of the year. July and August are the warmest and the least rainy months. Even in midsummer you must take into account some rain, and some nights a bit cool on the coast, and a bit cold in central inland areas. In summer, in good weather you can take a break at the beach and sunbathe, with an air temperature often pleasant and a cool breeze from the ocean, although as I said the sea is a bit cold for swimming. 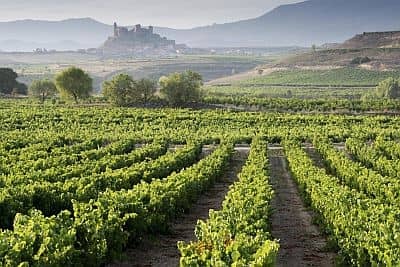 In the south, in the Ebro valley, which in summer can be very hot, you can go in spring and autumn, especially in May, and from mid-September to mid-October, although the rains are more frequent; in autumn, the landscape occupied by vast vineyards shows spectacular colors.